There is of course no “siege” on the Gaza Strip and no restrictions are imposed by Israel on the entry of medical equipment. 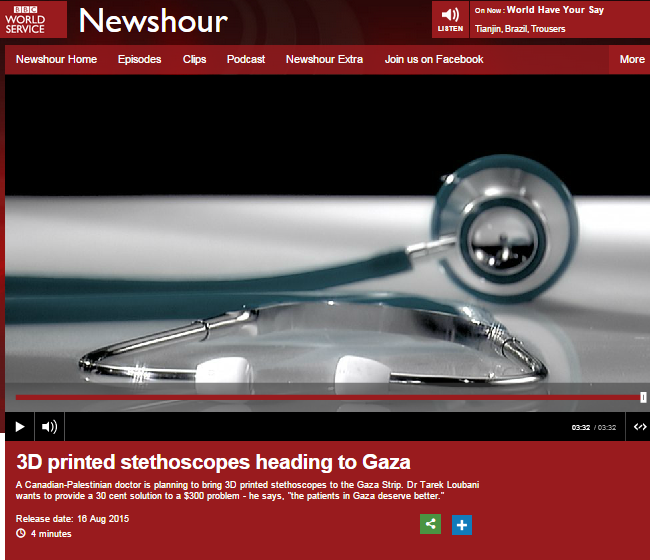 As it has unfortunately been necessary to point out here on numerous prior occasions due to inaccurate BBC reporting on that issue, shortages of medications and medical equipment in the Gaza Strip are due to long-standing disputes between the Palestinian Authority and Hamas. Julian Marshall however made no effort to relieve audiences of the inaccurate impression created by his interviewee – who, in response to a question concerning the material used to make his stethoscope, later promoted a similar inaccuracy. The only restrictions on materials entering the Gaza Strip are of course on weapons and dual-use goods which can be diverted to the purposes of terrorism. One presumes that before this item was recorded and broadcast the production team exercised due diligence by researching their interviewee. If that is the case, then the BBC will be aware of the fact that in addition to being a doctor, Kuwait-born Tarek Loubani (who moved to Canada at the age of ten) is a veteran political activist who in 2003 was arrested near Jenin and deported from Israel due to his activities with the International Solidarity Movement (ISM). Loubani was also arrested in Egypt in 2013 whilst trying to enter the Gaza Strip and in 2014 was detained at Ben Gurion airport. However, adherence to the BBC’s editorial guidelines on accuracy should obviously have prevented that falsehood from being broadcast literally worldwide and the editorial guidelines on impartiality should have ensured that listeners were made aware of Loubani’s political agenda and the fact that he is rather more than just a “physician”.